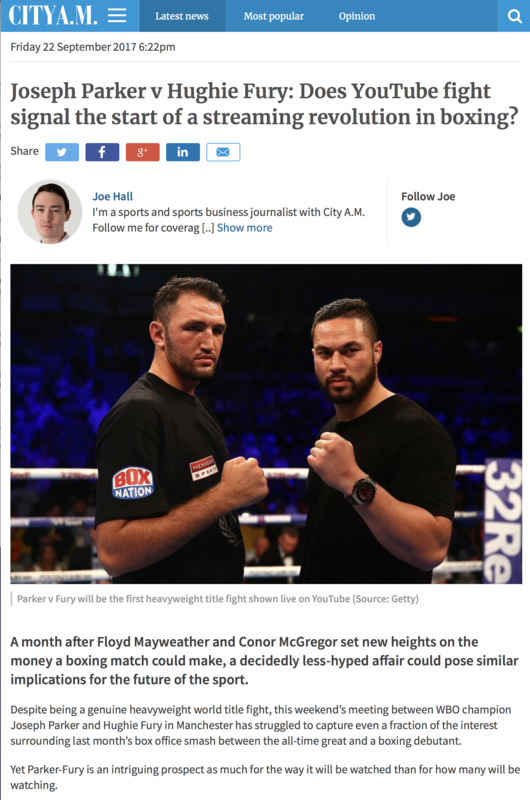 Objective: Leading boxing promoter Hennessy Sports secured the promotional rights to stage Hughie Fury’s challenge for the WBO World Heavyweight Championship against the World Champion Joseph Parker in Fury’s home city of Manchester and wanted to blitz the fight in the media.  In addition, Hennessy Sports wanted to highlight their ground-breaking partnership with YouTube to broadcast the fight around the world on a Pay-Per-View basis. Result: Through Fury’s unique spartan style training camp in the beautiful yet brutal mountains of Lake Windermere, it set the scene for a number of top level TV pieces with Sky Sports News, BBC News Breakfast, BBC North West, ITV and Associated Press and newspaper websites, including Daily Mail Online. Continuing with the theme of ‘old style’ boxing training, we recreated the iconic meat-punching scene from the original Rocky movie with Fury pounding on a side of beef in an abattoir that resulted in some stunning photos and videos that were quickly picked up by major online news sites including Daily Mirror Online, Manchester Evening News and New Zealand’s Newshub. 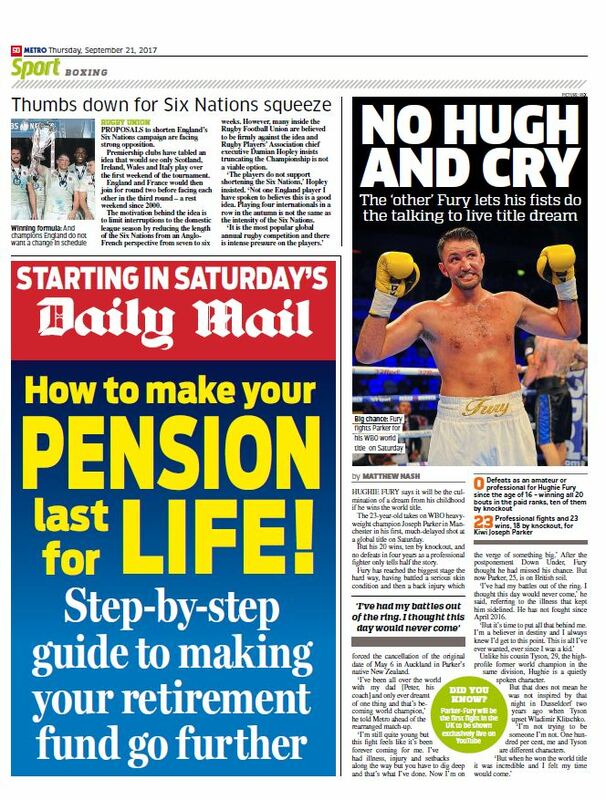 Interviews were set-up with Don McRae The Guardian (In Dropbox) who produced a stunning full-page article, Phil Thomas The Sun (in dropbox) which resulted in a double-page spread and a piece with Hughie’s father and trainer Peter Fury in the boxing trade newspaper Boxing News. We arranged for the final head-to-head press conference between Fury and Parker to take place at the legendary Old Trafford, the home of Manchester United fan Fury’s favourite football team, which proved to be an amazing backdrop that resulted in great coverage in the Daily Mail Online and ITV. With the assistance of Team Fury we got Fury down to United’s Carrington training ground where he met with star players including Antonio Valencia, Chris Smalling, Romelu Lukaku, Marouane Fellaini and Eric Bailly plus manager Jose Mourinho and the photos and videos were quickly distributed to the media to get instant coverage in The Sun Online, Daily Mail Online and Daily Mirror Online. Fury had a high profile appearance on the UK’s biggest breakfast show The Chris Evans BBC Radio 2 Breakfast Show (use image in dropbox) where he chatted with Chris and sports presenter Vassos Alexander. Finally on fight week, we arranged events open to the public to attend with a boxing workout at the city’s favourite entertainment destination The Printworks and the weigh-in at the popular Football Museum. To highlight the pioneering agreement with YouTube, Maynard Communications distributed a press release targeted at the sport business media that was picked up by TVBEurope, iSportConnect, SportsPro , a fantastic piece in the leading financial website Forbes and setting-up an interview with renown promoter Mick Hennessy and the leading free London business and financial newspaper City AM and arranging for Hennessy to do a live in-studio interview on the BBC Radio 5 Live’s flagship financial show Wake Up To Money to discuss the YouTube deal and engage in a discussion about PPV boxing and its future.